Insan Cendekia Madani Kindergarten Program uses Madani Curriculum that integrated with Islamic, National and Global curriculum to deliver dynamic, appropriate and academic experiences. 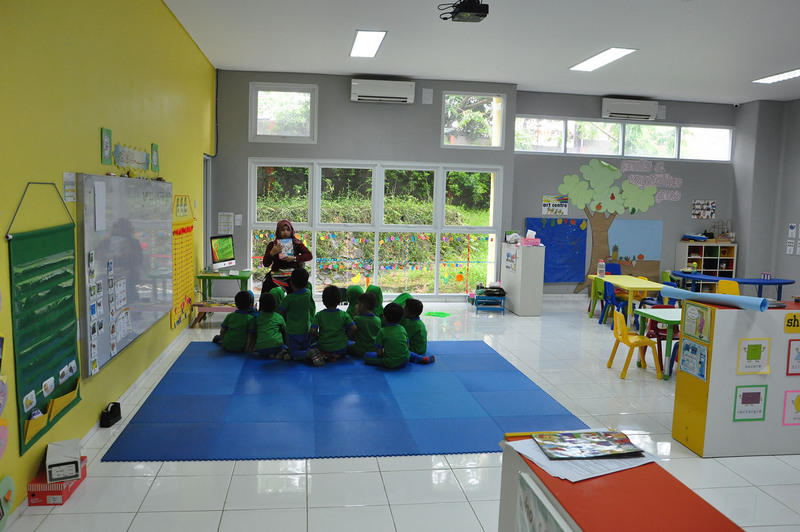 Active learning is the methodology used in Insan Cendekia Madani KindergartenProgram. The teaching and learning program develop enduring understanding of comprehensive concepts, placing individual children as the center of the process. Planning, teaching and assessing focus on the long-term education goals, with continuous reflection and communication between school, children and parents being the essential part of our program. Children are able to develop their knowledge and skills. Extracurricular will be held every Friday during school hours. The duration for each activity is about 60 minutes. The children’ learning is conducted through thematic approach applied in active learning methodology. During one academic year, children will develop themselves through four main themes in four terms. The chosen themes are designed to accommodate the school’s mission and vision. Teacher is given the liberty to design proper programs and activities based on the children’s abilities and needs within her classroom, especially in Learning Areas. This also aligns with our view to put forward every child’s strength and uniqueness, while also keeping an eye open on developmental milestones and profiles as our foothold in assessing the children all throughout the academic year. Teacher and children are responsible for the on-going-assessment of children’ progress and development. International and national benchmarks are used by Insan Cendekia Madani school to ensure the school is meeting acceptable standards in all areas of learning. In Kindergarten program, teachers give on-going observation in order to gather specific information about each child’s development on daily basis. The children report abides by Insan Cendekia Madani Curriculum. Based on government policy, ICM has the privilege to make its own report card based on each student’s development. A diverse language environment empowers our children to achieve the highest levels of literacy possible. Children are further enriched through the development of other languages which includes the learning of cultures and literature. Insan Cendekia Madani implements a Dual Language program. This program provides opportunities for children to use both English and Indonesian in academic and social situations. We respect and continue the development of the first language. A high level of proficiency in two languages is the goal of dual language education. Reading literature is one way to allow us to understand ourselves, others and the world around us. Children read for enjoyment, instruction and information so children are given the opportunities to do so through exposure to wide range of selected fiction and non-fiction texts. During this library time, children listen to a story told by a teacher, explore books, choose a book to be borrowed and for kindergarten children there will be a short session when they can share their favorite story. At Insan Cendekia Madani Kindergarten Program, a phonics program has been established to encourage children to learn sound and symbols through fun and engaging activities. It has also been designed specifically for the needs of our children, to develop their phonetic awareness, and finally they will enjoy variety of texts according to their level of understandings. As part of the learning strategies school events and field trips provide the students with opportunities to apply academic, interpersonal, and intra personal skills in real life settings. Should be related to the learning content students have received in the classes. Bridges the theory given in the school learning activities with the real-life application. Provides ways for students to exercise their observing and analytical skills. Each student is expected to show her/his best behavior while participating on field trips, as s/he is the Ambassadors of Insan Cendekia Madani. The ICM Academic Calendar is divided into four terms, each term consists of about ten weeks. At the end of each term, the children have a holiday and a four-week holiday at the end of the academic year. The parents are given the academic calendar at the beginning of each school year. The calendar will indicate holidays, special events, and conferences, etc. If there are any necessary changes in the school calendar, the changes will be announced through special notices. Teachers must love working with students, be able to communicate with students and parents, possess minimum of bachelor degree, and be able to speak and write fluently in Indonesian and English. To monitor, maintain teachers’ quality and performance, Quality Assurance provides training, professional development, and sharing session. The teachers are trained in the Insan Cendekia Madani approach. Teachers participate in various of professional development activities to enhance their practices and improve students’ learning. During the implementation, teachers are given opportunities to refresh their knowledge through sharing session programs. Teachers are also being observed and given feedback regularly. The success of children education is determined by school, parent, and community. Parents of Sekolah Insan Cendekia Madani must attend parents’ workshops organized by Quality Assurance. Parents and school as main part must work with a harmony to make education processes running well. School facilitates many activities and opportunities for parents to engage the education processes in school as well as houses through various parents’ workshops. Parents as a part of community has the role in educating their children. The experiences, insight and knowledge that they get from this program can be sustainable and implemented in community.